Online retail sales in the UK reached an estimated £52.25 billion in 2015, with the average shopper spending an incredible £1,174 online. But if you’re an eCommercer looking at this figure right now and want to find me and hurt me because you don’t know how to get in on this success soufflé then luckily for you – and me – eCommerce Live UK is back to save the day. 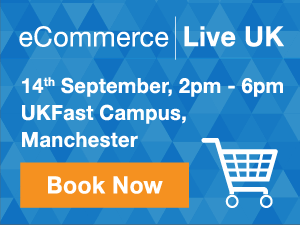 On Wednesday September 14th industry experts will be joining us at the UKFast Campus for the exclusive event, exploring how technology will shape the future of eCommerce, and sharing first-hand experiences and top tips for success. What makes a successful eCommerce business tick? What are the latest industry innovations? Is your business up to speed? If you’re serious about succeeding in eCommerce it’s likely these questions are probably already on your radar (read: keeping you up until four in the morning, eating cereal out of the box and frantically searching the internet for answers). Well, a much easier solution – and one that’s less detrimental to your cereal expenditure – is to come to eCommerce Live UK 2016. You’ll hear first-hand the experiences from some of the UK’s most rapidly growing retailers, who will impart their top tips, hard-learned lessons, and secrets to success. With Black Friday and Cyber Monday already on the horizon, industry-leading experts will give you the lowdown on the key trends in online retail for 2016-17, and explain how you can increase conversions and accelerate business growth in time for the Christmas rush. From the importance of speed and uptime, to the latest developments in mobile and omnichannel retail, eCommerce Live will give you all the tools and tips you need to succeed online. We’ll be announcing industry expert speakers over the next couple of weeks, so stay tuned for updates. Set yourself on the path to eCommerce success – places are limited so sign up today!